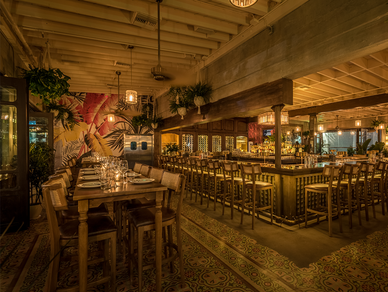 DAMA is a Latin-inspired restaurant and bar with deco-tropical design by partners Antonia Lofaso, Pablo Moix, Steve Livigni, Mario Guddemi and Salvatore Aurora (Scopa Italian Roots, The Chestnut Club, Black Market Liquor Bar, Old Lightning) located in the Fashion District, Downton Los Angeles at City Market South. The former Pacific Banana Co. building has been transformed into a lush indoor-outdoor cocktail bar and outdoor patio with exceptional food and beverage offerings. The top-notch cocktail menu designed by Pablo Moix, combines both classic and tropical favorites, executed with precision, technique and consistency. Chef Lofaso's menu is filled with shareable flavor forward dishes, all of which were inspired by her travels to Spanish, Latin American and Caribbean countries. The expansive 5,000 sq. ft. venue features a plush indoor lounge, three semi-private terraces, a large outdoor patio and can seat up to 190 guests.